My First Circus Puzzle Discounts Apply ! 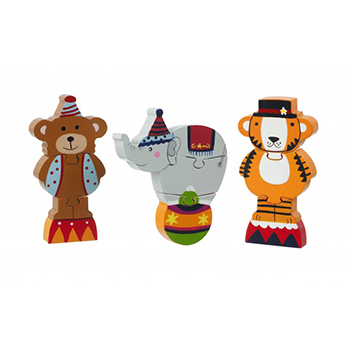 Set of 3 traditional wooden children's puzzles from our Circus range. The set consists of three wooden puzzles each made up of 3 pieces, perfect for little hands. There is a circus bear, elephant and tiger . Each puzzle is hand painted using bright colours. Simple for a toddler to put together, this set can help with colour recognition, fine motor skills as well as developing stories and imagination with the completed characters..
A set of 3 traditional wooden puzzles from our Circus range. Each puzzle is made up of 3 pieces.